I tried running DxDiag (DirectX diagnostics), and I noticed that my graphics card is set to the onboard one that comes with the Core i5 processor (some Intel HD stuff). On my computer, I also have a dedicated graphics card (an Nvidia 310). No serious gaming stuff, I know - just for programming. However, I would still love to know how to switch to that dedicated graphics card instead. My laptop is an MSI CX720. I had to toggle my prepared graphics processor from the Nvidia control panel (pretty weird), and then it worked just fine. A reboot was required. This setting only exists for Nvidia Mobile ("M") series graphics cards. Just in case anyone else reading this is a massive idiot like me, one other way to prioritise a dedicated GPU over an onboard one, without having to worry about fiddling about with your BIOS etc, is to plug your monitor into the socket on the dedicated GPU rather than the one on the onboard graphics card. Only took about an hour of mucking about with settings for me to spot that one! Disable the on-board graphics, possibly by disabling any shared graphics memory (or setting allocation to automatic). Set the primary adapter to be the dedicated card, PCI-e x16 or similar (BIOS dependant). Simply right click on the game icon and hover your pointer over "Run with graphics processor". You could choose from the options as "integrated graphics" and "High performance Nvidia Graphics". That works on windows 7. No need to look into BIOS. Will using the dedicated graphics card improve performance? Linux: How to use onboard graphics card for graphics and not the dedicated GPGPU? 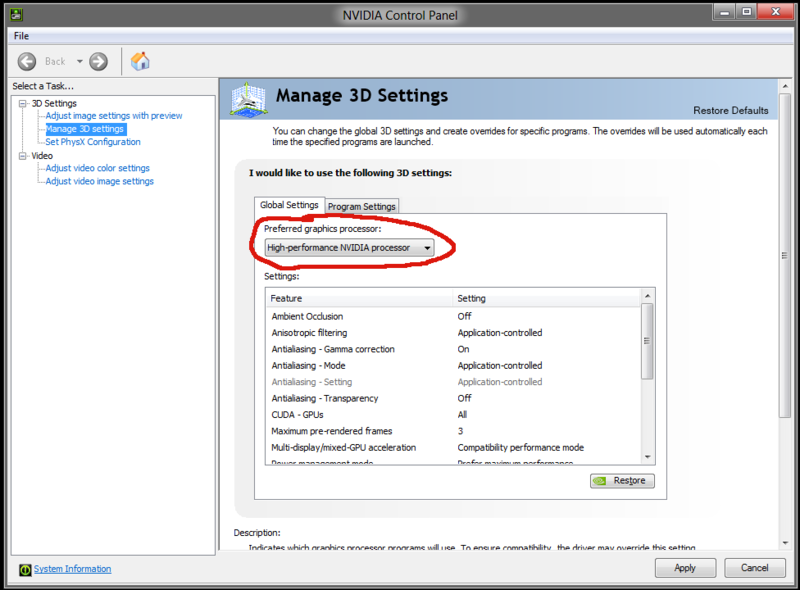 Do 3Ds Max and other 3D programs use the dedicated graphic card by default, if not specified?